Last Friday, May First, hundreds of activists from Bloomington gathered at the Indiana University Sample Gates and took to the streets to celebrate International Worker’s Day. This holiday, known as May Day has been celebrated across the world since 1886 in honor of the struggle of labor against capitalism. The first May Day occurred in Chicago as a general strike of hundreds of thousands of workers demanding the eight hour day. Three days later in Haymarket Square,a large gathering in support of the strike was attacked by the police, in the confusion a bomb was thrown into the crowd killing several people. The Chicago police arrested and falsely accused several anarchist activists of the bombing, some of whom were executed or imprisoned. Since then, May Day has been an international symbol of resistance for socialists, anarchists and communists alike. The U.$. and its capitalist government has done everything in its power to erase May Day from the collective memory of the working class, but here in Bloomington in solidarity with others across the nation we took a step toward reclaiming what rightfully belongs to us! This May Day held special significance as the attention of the masses has been drawn to the Baltimore Uprising as the latest example of mass resistance to capitalist state repression. This fact was not lost on us, and our plan to reclaim May Day quickly became an opportunity to unite the struggle against police violence with the struggle against capitalism by holding a Memorial for Freddie Gray at the conclusion of the May Day march. Our hopes for this endeavor were exceeded by the impressive turnout to both the May Day Rally and the Freddie Gray Memorial. Activists from various student and community organizations opened lines of communication that have put into motion plans to address policing and labor rights in Bloomington. Both demonstrations took to the streets after a short rally, marching down the middle of Kirkwood avenue and back up Third Street past the Bloomington Police Department. Demonstrators carried signs inscribed with messages of “All Power to Labor” and “Black Lives Matter” side by side, indicating the unity of these struggles. Both marches blocked intersections turning ownership of the streets to us, making our message unavoidable. This experience was significant for the power of its expression but also for teaching us about the efficacy of certain tactics. We have learned that the tactics of demonstrating and marching must be suited to the cohesion of the crowd and the way the political message is mediated by national events. These are the conditions which made the marches, especially the second, successful. Despite these minor errors, the large turnout and opening of lines of communication have created a foundation on which we can build. Those who spoke at the May Day rally helped make it clear that all struggles against oppression are aspects of the class struggle. We believe we have helped to bring this idea to the Bloomington community. For us, this is only a beginning but it was a strong one. We would like to thank everyone who attended the two demonstrations Friday for your participation and solidarity. We would also like to thank all those groups and individuals who assisted us in spreading the word, you were absolutely essential to drawing a crowd that large in such short notice. AND: Throughout the day, there will be films screened in the Monroe County Public Library in the auditorium (titles and times TBA). There will also be guerrilla art installations, re-enactments of radical history, spontaneous punk shows in unlikely places, etc, etc. Are you interested in creating a sustainable, egalitarian, inclusive society? So are we! 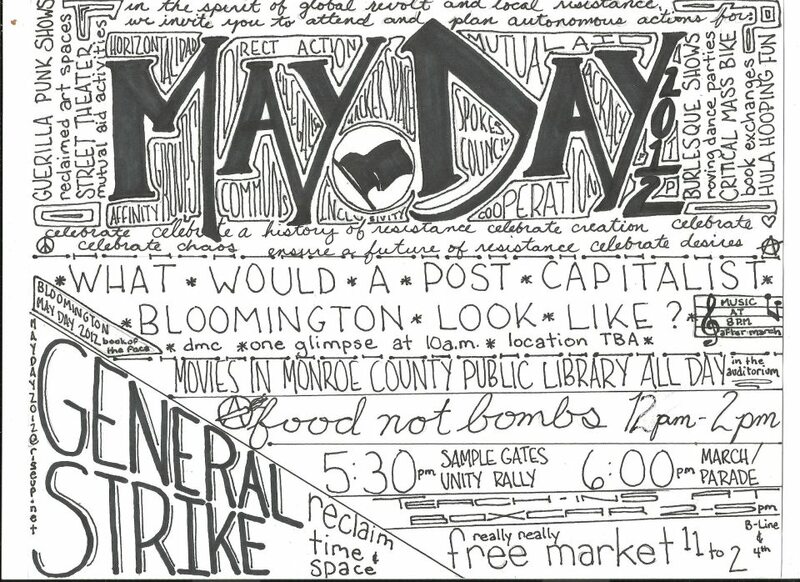 In accordance with the global revolts and the fresh resistance here in the United States — particularly here in Bloomington — we invite you to attend and plan for Mayday 2012. 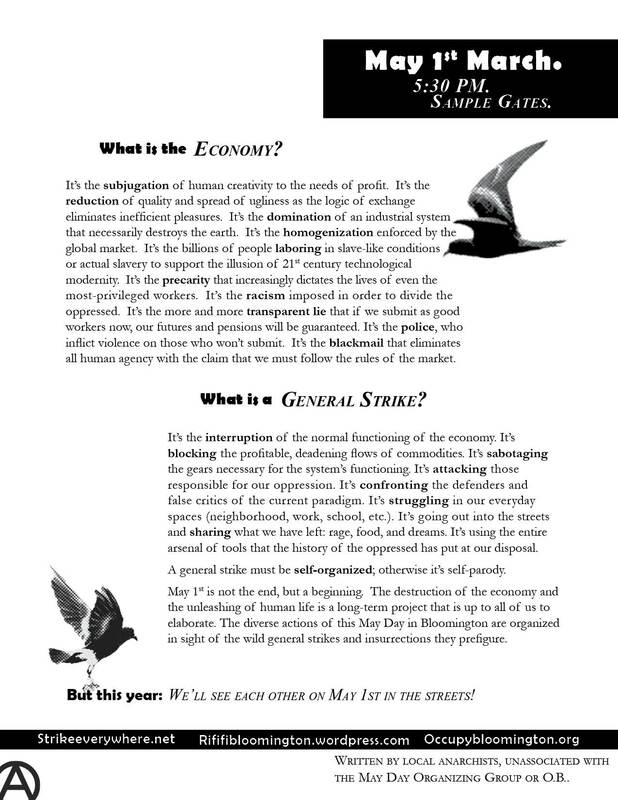 On May 1st, we call on all of Bloomington to celebrate Mayday 2012 with a General Strike, in the spirit of resistance against capitalist exploitation and state oppression. Are you a worker, schemer, dreamer, artist, unemployed, funemployed trouble maker? Getting involved is more than just going to a meeting. Its building a new culture of resistance in Bloomington; expect teach ins, meals, actions, occupations, theater, art installations, parades, critical mass bike rides, and a roving dance party as well as sneak peaks into a post-revolutionary Bloomington. These events will be presented in a “Tour of Resistance” style, with a map listing times and places to follow throughout the day. E-mail mayday2012@riseup.net with a brief description of your project, the time and location you’ll present it, and any questions you might have, and any help you might need. So far, groups such as Food Not Bombs, DMC Street Theater Troupe, Revolutionary Cinema Cooperative, Occupy Bloomington, Occupy IU, Bloomington Really Really Free Market, May Day Artists Guild, T.W.F. Scraps, HARM have expressed that they will be participating in the day’s festivities. Last scheming meeting for May Day will be April 29th from 3-5 at MCPL in room 1A. This text was distributed en masse during the microphone demo in People’s Park yesterday. A printable version is here: stormypetrel. 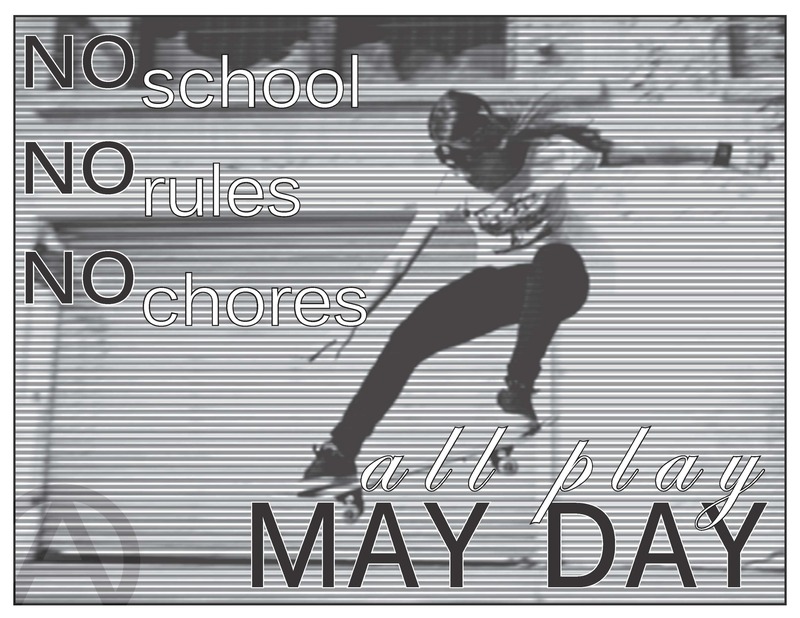 Let’s get pumped up for Mayday!!! 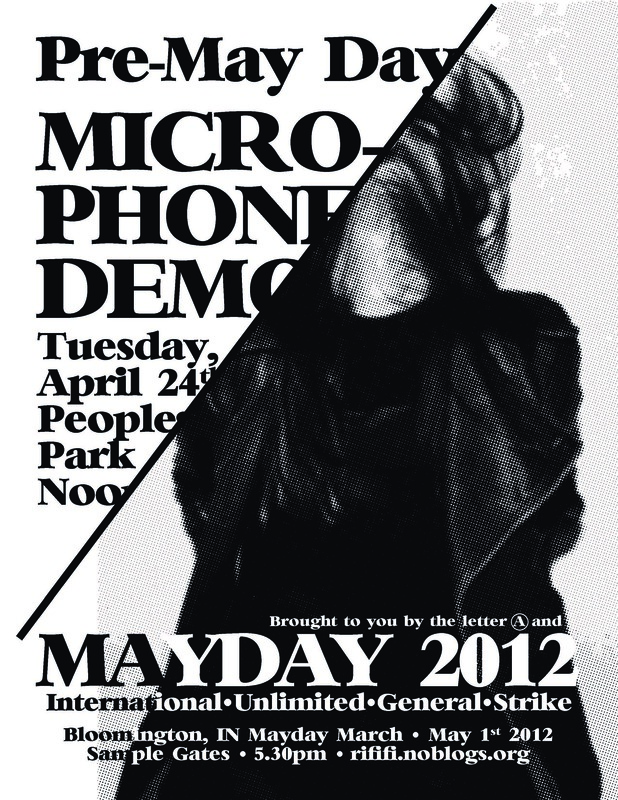 Tuesday, April 24th, noon, People’s Park. Hang out, play games, listen to music, read things on a microphone.